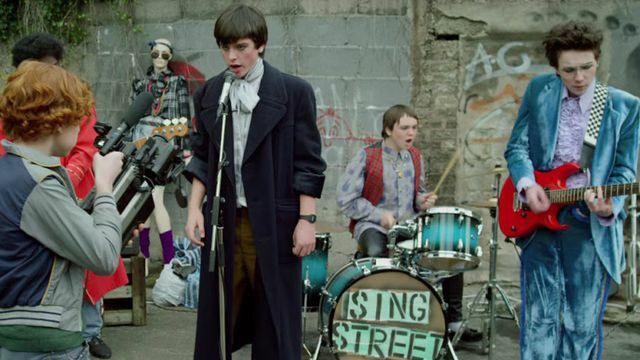 The world needs Sing Street. There are dozens of great films released each year, but a select few make me feel a certain wonderful way. The type of picture that has a beating, beautiful heart that pumps life into every scene, making it impossible not to smile throughout the entire damn thing. Beyond the fact that they usually dabble in or around the comedy genre, these films don't have to be alike besides their ability to charm and delight. Two years ago it was the shockingly brilliant The Lego Movie, a film that initially seemed like nothing more than a means to sell more toys but turned out to be layered and moving and constantly funny. Last year it was the completely joyous, optimistic and endlessly entertaining Magic Mike XXL, a delicious slice of cinema that I have revisited a few times whenever I need to a reminder that art can be completely void of cynicism and cruelty of any kind. A film that presents the gods on stage as flawed but embraces humanity of all colors, shapes and sizes. Honestly, I just put the Magic Mike XXL Blu-ray in right now so I could keep the good vibes flowing as I wrote this. I had turned the news on, a stream of reminders that the world can be violent, dark and cold, and it isn't that I want to turn my back on reality or shrug my shoulders from inside my own bubble made of safety and fortunate circumstances. Sometimes I care too much about what is happening in the world, and it literally hurts to think about it. That's precisely why I needed to change the channel, why I needed to watch a film that makes me smile. I feel like I am floating just above the ground and I am in too good of a mood to come down just yet. I have writer/director John Carney and Sing Street to thank for this magical feeling. The film takes place in Dublin, Ireland during the 1980's, and it tells the story of a 14 year old boy named Conor (Ferdia Walsh-Peelo) and the struggles he has with his family. His parents have financial troubles and their marriage is falling apart, and they make Conor go to a new public school located in the city and the transition isn't easy. Bullied by both classmates and teachers, he needs an escape and he finds it in the spellbinding eyes of a pretty girl sitting across the street named Raphina (Lucy Boynton). She says she is a model. Conor says he is in a band. He isn't. When he asks Raphina to be in the music video they will be filming and she agrees, it's exciting but it creates a problem: Conor needs to actually form a band. With the help of some friends and the trends of the decade they live in serving as inspiration, they form a group called Sing Street but this isn't a lazy set up solely to meet a girl. They pour their time and energy into the music and lyrics of their songs, resulting in some genuinely terrific tracks that capture an audience and perhaps Raphina's heart as well. 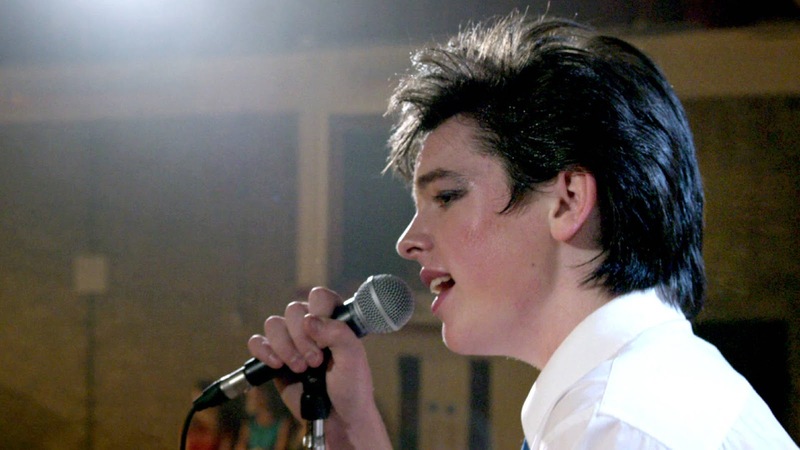 An outstanding script, charming performances and great music, I couldn't get enough of Sing Street, and even though it strays down some pretty tired romantic comedy territory with the path of Conor and Raphina's relationship during the second half of the movie, it all works because the film earned the emotional connection I made with it. Two stories can end the exact same way, yet only one will work while the other may fail because weak characters with little chemistry expose the tropes. Great characters who all fit perfectly together on screen celebrate them. Bring out the best in them. We need films like this every so often. Stories that don't necessarily have to be perfect or 100 percent original yet they thrive thanks to a screenwriter whose pen pulses with passion and feeling. Actors who buy into the material and sell it during every scene. Catchy music that elevates a good moment into a great one. There is one aspect of Sing Street that made me a little sad, yet it touched me at the same time and that is the dynamic between Conor and his older brother Brendan (Jack Reynor). On the one hand it served as a reminder that busy lives and just enough distance to make hanging out difficult keeps me and my older brother from fully connecting, essentially rendering our relationship to special occasions only. On the other hand, I was able to see the joy in Brendan's face when Conor decides to go in a different direction and live his life, and it's a pretty special thing knowing if I had to, I could pick up the phone and call right now and have someone there for me no matter what. The world needs the occasional escape, a reason to laugh, smile and root for love. Ever since this movie came out I've been hearing "Sing Street is the best of the year" all over the place. Guess I'll just have to watch it. I was surprised too Cody, saw some critics I trust raving about it. It wasn't really even on my radar until then, but I am so glad I got a chance to see it. A blast.